In recent weeks, we (in our office) have begun taking turns with some pimping of snacks, inspired by the website. 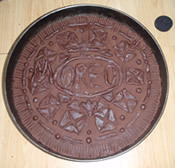 The first was a Pimped Jaffa Cake, followed closely by a Wagon Wheel and a Kit-Kat Chunky... then it was my turn. Not being totally convinced of my cooking/baking skills, I decided I would try pimping the mighty Twix. As a ‘Pimp Virgin’, I first had to decide on scale – should I go huge, and potentially unmanageable, or should I just go Big? Then I had to decide how I would actually form these things – should I go the tube/pipe route? Eventually, I decided upon forming two large fingers, instead of one huge single finger. 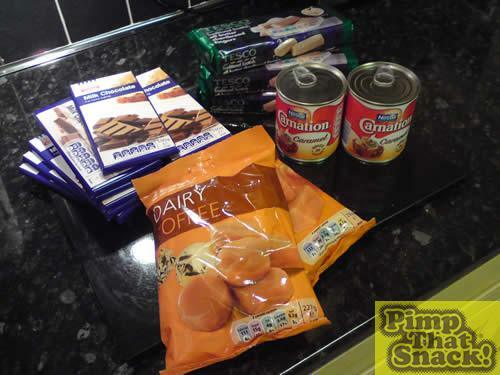 The total cost of those ingredients came to £9.00. 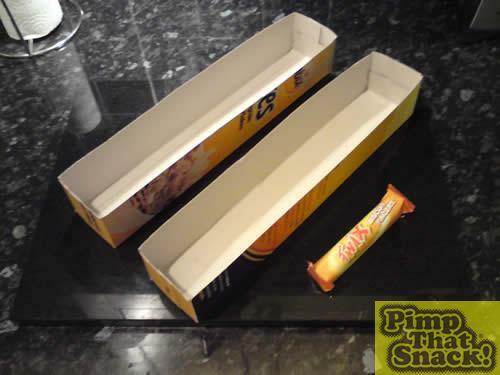 For the moulds, I cut a cereal box lengthways in half, and trimmed then down, and taped the ends to form two rectangular shapes – the sizes being circa 30cm long x 8cm wide. I then lined the moulds with greaseproof paper. Ok, onto the actual ‘cooking’!! I started by melting 4 bars of the chocolate over a pan of boiling water. 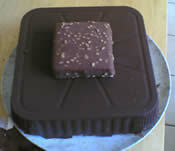 Once fully melted with no lumps, I transferred this over the two moulds, which gave a base thickness of about 1.5 – 2cm. I decided to cheat with the biscuit element of the filling, and rather than spoiling it with rubbish homemade biscuit, I opted to go for ready made shortbread fingers. 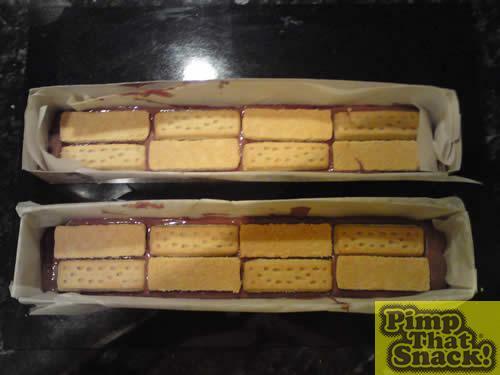 While the chocolate was still warm I then layered the shortbread, 2 fingers wide along the length of the moulds – that used 8 shortbread fingers per bar, 16 in total.